At freetobook we were delighted to read a recent article in The Herald about the new generation of boutique B&Bs in Scotland, which it describes as “increasingly fashionable, even becoming the top choice for young travellers”. It highlights the importance of giving guests a ‘personal experience’ – something we know that our freetobookers excel at! 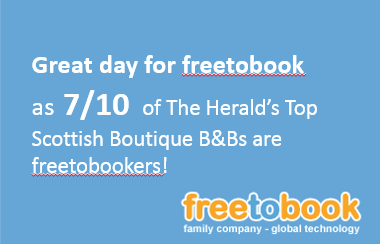 So it was no surprise to find that of the ten properties chosen by The Herald as their top Scottish boutique B&Bs, seven were freetobookers! Huge congratulations to Brucefield Boutique B&B, Rudha-Na-Craige, Firhall Highland Bed and Breakfast, Ardtorna Bed and Breakfast, Kingsmuir House, Lys-Na-Greyne and Barony House – brilliant to see you all featured, well deserved! And finally some more excellent news – it’s a double celebration for Kingsmuir House, who have been awarded Most Hospitable B&B at the VisitScotland Thistle Awards! Remember every property in Scotland is entitled to a free listing on VisitScotland and freetobook properties pay no commission on those bookings – double freebie! Our freetobookers across the world consistently offer great accommodation, great service and great experiences to their guests, so it’s brilliant to see whenever you get some extra recognition! We are proud to offer a system that helps you manage your bookings and make life a little easier – so you can continue delivering a top quality experience to your guests. At freetobook we love to hear about your achievements – keep up the great work freetobookers! In an open letter this week to boutique hotel and B&B owners, Airbnb have just announced that going forward they want to ensure that small business owners have access to their community of travelers. Airbnb has always been a favourite of thousands of freetobook customers; over the years a large number have registered with Airbnb and use it as a great source of bookings. It’s good news that small hotels, bed and breakfasts and unique properties are now officially recognised and welcome to the Airbnb site. Freetobook has always been a supporter of unique, independent, interesting and diverse accommodation; these are values we share with Airbnb, so its no surprise to us that so many of our customers enjoy bookings from them. Together we celebrate and support diversity, uniqueness and personal hospitality; after all, despite our size we too are a family business passionate about our customers and what you do. There is another reason we support Airbnb for our customers. Over the past years the big OTAs have got bigger, they continue to grow, and their commissions are cripplingly high to so many small businesses. Compared to the OTAs Airbnb has a far lower commission to accommodation owners, which gives you a welcome choice. At freetobook we support diversity of bookings, encouraging our customers not to have all their eggs in one basket and to be over reliant on one big OTA. Airbnb is a competitor of the large OTAs and therefore an additional independent source of bookings that can help make the booking environment healthier with more players. Thousands of freetobook customers already list on Aribnb and update their availability using our iCal feature. We are in discussions to enrich the functionality of our connection with Airbnb and help our customers get even more out of the Airbnb connection. Further news of this will be announced in the future. If you are interested in becoming an Airbnb customer (or already are one) you can link your availability from your freetobook diary (you can only do this after you have an Airbnb listing). If you fit their requirments then request an account as a professional listing “hotel”. After requesting an account Airbnb will check if you meet their criteria and approve or reject your request.